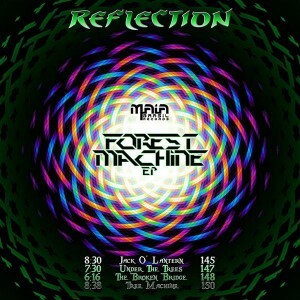 Australian producer Reflection (Gibb Tartaris) returns to Maia Brasil Records with Forest Machine, a fresh collection of tunes showing off a new side to his sound inspired by his European tour. Blending forest music influences with spooky leads, non-standard rhythms, and metal guitars, Reflection once again breaks the rules in the psytrance scene to bring something new to your ears. Expect more like this and new styles to come in the future! Artwork by InertG, mastering by Ryanosaurus. MP3 Download | FLAC Download | WAV Download · Download count: 10,372.
echoing drew, above: Reflection consistently puts out great music, and this collection is no exception.